Our Practice - John C. Lawyer, O.D., Ltd.
Dr. John Lawyer was raised in Las Vegas and graduated from Clark High School. He received his Bachelor of Science degree in Biology from University of Nevada, Las Vegas. Dr. Lawyer received the Doctor of Optometry degree from the Southern California College of Optometry in 1988. Upon graduation he obtained licenses in California, Arizona, Nevada and most recently Colorado. Dr. Lawyer is Board Certified in the Treatment and Management of Ocular disease. He worked for Jeffrey Kleimann in Los Angeles, CA before opening his own practice in 1989. 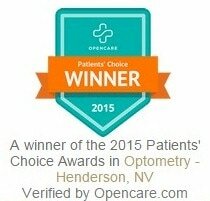 As an eye care team, we will work together to provide exceptional customer service. Our skilled opticians have over 10 years of experience and are ABO and NCLE certified.